This year, Barack Obama will be entering into his sixth year as president. As prescribed by the Constitution, the president will deliver the State of the Union address later this month to update Congress, as well as the American people, about the general health and future of the nation. The Obama administration is looking to accomplish a great deal during its remaining years tenure in the White House. This is especially the case now that the midterm elections are over and much of the pressure from politically vulnerable congressional Democrats for the president to resign himself to the sidelines has dissipated. Ahead of his Jan. 20 address, Mr. Obama has decided to deviate a bit from past precedents. Instead of unveiling his political and legislative agenda for the year, the president has chosen to present snippets of his plans, and to begin pressing his case immediately following his end of the year holiday vacation. In carrying-out his legislative preview, Mr. Obama plans on stopping in at least three states—Michigan, Arizona and Tennessee—where he’ll discuss different areas of his economic agenda. In Michigan, the president will speak of his administration’s past investments into the country’s various manufacturing industries. He will especially address the resources steered into the state’s auto-industry. In 2009, the Obama administration spearheaded the Auto Recovery and Reinvestment Act, which in essence, financially bailed-out the Big Three automakers in Detroit. In returning to Michigan, Mr. Obama will look to build steam off his previous successes as he looks forward to adding more benefits and relief to working-class Americans. In Arizona, Mr. Obama will speak of his administration’s accomplishments in breathing new life into the nation’s housing market. Namely, the president addressed some his previous measures which helped reduce the risks within the mortgage industry and ultimately helped to provide more protections to both mortgage lenders and consumers. In citing his concern that homeownership is still too far out of the reach for many Americans, Mr. Obama also announced his plans to slash the fees that the federal government charges to guarantee mortgages. This move, the White House says, will help over 800,000 homeowners save on their monthly mortgages. In Tennessee, Mr. Obama plans to talk about his past efforts to make higher education more affordable and about his plans to help bring down the costs associated with higher learning. To highlight some of his administration’s actions in trying to improve access to education for young Americans, the president plans to unveil a new manufacturing hub located in Tennessee. This hub is one of the half-dozen or so, public-private partnerships that Mr. Obama has helped to create since becoming president. These hubs are useful because they bring together colleges and universities, federally-backed researchers and facilities, and private companies in efforts to jump-start job creation and career opportunities. All of these efforts sound desirable. However the question remains, are they feasible under the newly sworn-in Congress? Since last year’s midterm elections, the president has issued a series of executive orders to the frustration of many Republicans. Such orders have included new federal policies to stop deporting people whom enter the country illegally, new sanctions on North Korea for its alleged breach of Sony’s computer systems, new carbon emission standards, and his plans to begin normalizing relations with Cuba. Undoubtedly, now that Republicans control Congress, it will be much more difficult for the president to govern by executive order alone. Executive orders at this point will be tempered by Mr. Obama’s desire to see his legislation gain traction in Congress. Without support and some level of compromise from Republican leaders in Congress, it will be nearly impossible for the president to move any of his pet initiatives through the nation’s legislature. Though cooperation between this new Congress and the White House may seem quite distant at this point, there are many areas where these two branches of government agree. This can be seen with the end of the year’s passage of the $1 trillion omnibus spending bill for the nation. Both Congress and the White House understand the importance of governing effectively and avoiding the type of stalemates which have proved especially costly for both major political parties in the past. Also, it is important for both Mr. Obama, and Speaker of the House, John Boehner, to illustrate early on their ability to perform effectively during this Congressional session. For Mr. Obama, now entering his lame duck years, we know that this will mean the use of a mixture of both executive and legislative actions. For Mr. Boehner, a blueprint of his early strategy would most likely include, reining in the more extreme elements of his party, and rewarding those moderate Republicans that remain loyal, as well as those Democrats whom occasionally cross the aisle. 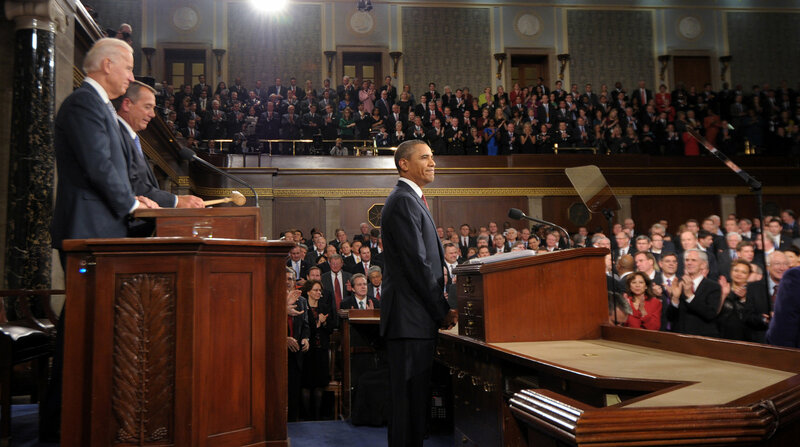 I encourage readers to tune in Jan. 20 as the president delivers his sixth State of the Union address. Author: Antwain Leach, MPA, was previously employed as a congressional aide in the office of former Congressman Bart Gordon. He is the current president of the Center for Strategic Affairs and Public Diplomacy, a think tank that provides management consulting services to political organizations, social campaigns, as well as to nonprofit organizations. His scholarly research focuses on Congress and its relationship to the conduct and formation of U.S. foreign policy. His research interests also include analyzing bureaucratic agencies, regulatory politics, as well as government & business relations. You can reach Mr. Leach at [email protected].